Harissa Substitute – What to Use ? A lot of middle eastern recipes may call for the addition of harissa paste to help give a bit of heat. If you are all out, what makes a good harissa substitute ? They say that a little harissa goes a long way but if you don’t have any, then you aren’t going to get very far. While you may get away with leaving out some spices, harissa is an essential ingredient that your dish just won’t be the same without. That is, unless you find an adequate substitute. What Is Harissa Anyway? You can’t exactly find a substitute if you don’t know what you’re substituting; however, don’t panic if the harissa takes you by surprise. 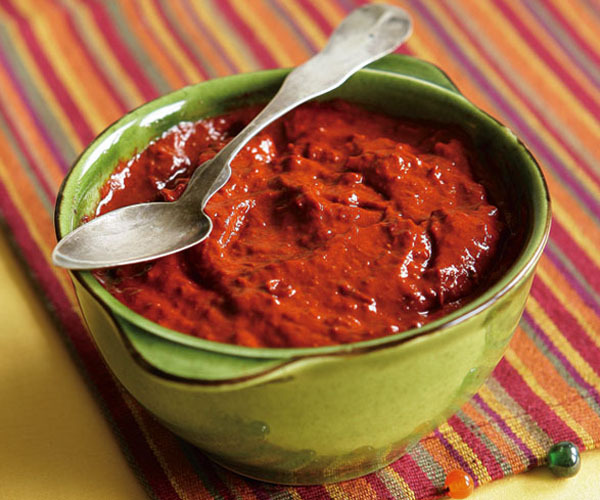 Harissa is a Tunisian chili paste rooted in North African and Middle Eastern cooking. If you can’t find it in ethnic aisles of the grocery store, you would likely need to visit a Middle Eastern market. What are some good harissa replacements? If you live in an area without any Middle Eastern markets and can’t find harissa at the grocery store or if you are an experienced harissa handler and have simply run out, there are some other common items that should be able to satisfy your recipe. In either case, harissa recipes themselves are fairly simple, and you could go that route as well. While not all chili pastes will accurately match the flavor, there are some that are viable substitutes. The closest is sambal oelek, which is perhaps a more neutral chili paste but you can also add spices such as cumin for additional flavor. Sambal oelek is typically more often stocked at supermarkets and the recipe is very simple. When you are searching for harissa substitutes, as far as other chili pastes go, simplicity is the best option. Sambal oelek is primarily chilies, vinegar, and salt. Here’s something that you may already have in your kitchen: sriracha. While Sriracha is technically classified as a sauce as opposed to a paste, it can make an excellent harissa substitute. Both the flavor and the heat are in line with the harissa and Sriracha should give you a similar spiciness. Again, feel free to add additional spices such as cumin or coriander to liven up the sriracha even further, which will also thicken it up a bit. The problem with adding red pepper flakes is that if your recipe relies on the harissa for thickness or consistency, red pepper flakes will provide zero percent of that and your recipe could fall flat. If, however, the primary purpose for the harissa is heat, red pepper flakes might just do the trick. If availability is the issue, don’t overestimate the difficulty of making your own harissa. While you may not find ready-made harissa at the grocery store, you should definitely be able to find the ingredients to make it yourself. Other recipes may call for tomatoes or even mint but the point is that it’s super easy and if you have the time, it may be the better way to go.